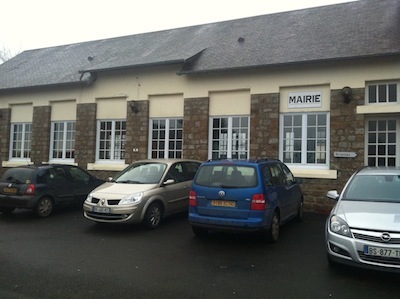 Brian writes: Over the weekend we went to a Chinese New Year party at a community hall in a nearby town here in Normandy. As this year is the Year of the Snake, most of the crafts the kids made and the activities and workshops they completed were snake-themed! We had a fun day out together with our friends and their kids, so I thought I’d write a quick article about the day here. I also hope that this post might give you a few ideas about crafts, activities and centers that you can complete with your own children or students to learn about and celebrate Chinese New Year. 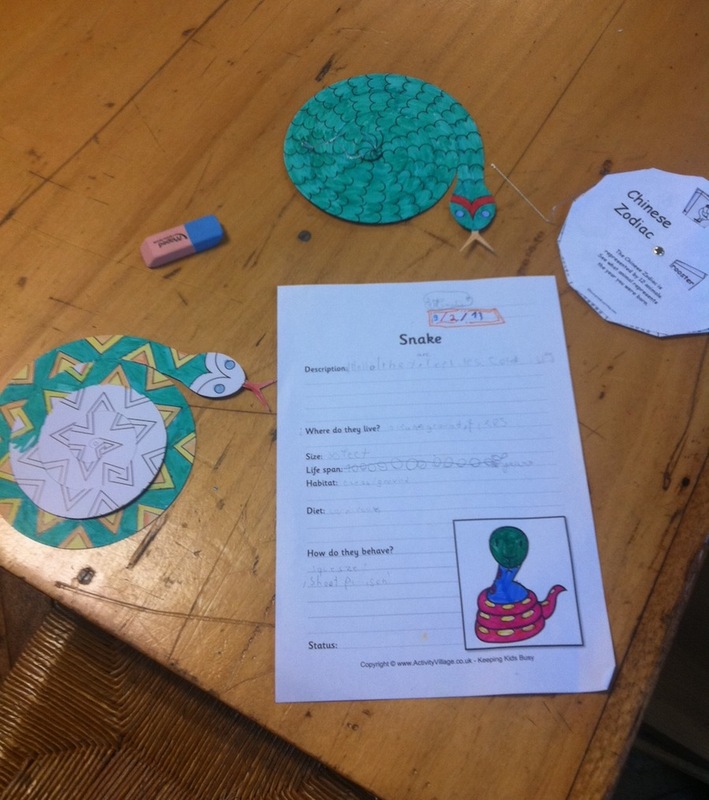 The first activity the kids completed was an at-home activity: writing and illustrating a story about a snake. The story could be any sort of story! Both of our kids composed their own stories and brought them to the hall. 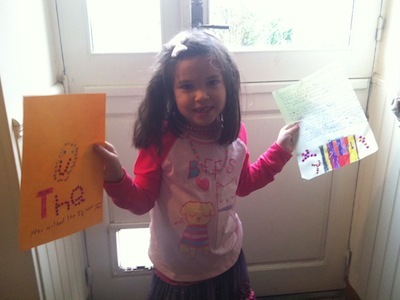 Our daughter and her Chinese New Year story about a snake – she worked hard on it! 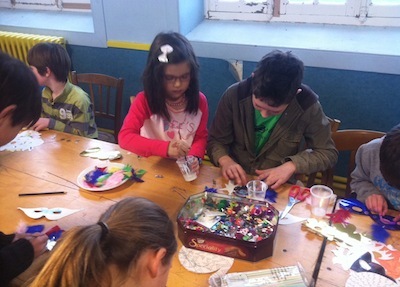 Once we arrived at the party, the kids immediately got involved with working on a variety of different pre-planned activities. Each child received a worksheet with questions to answer about snakes, and a drawing to complete and color. They also created a Chinese Zodiac calendar and some colorful hanging snake decorations that they cut out and colored in however they chose. 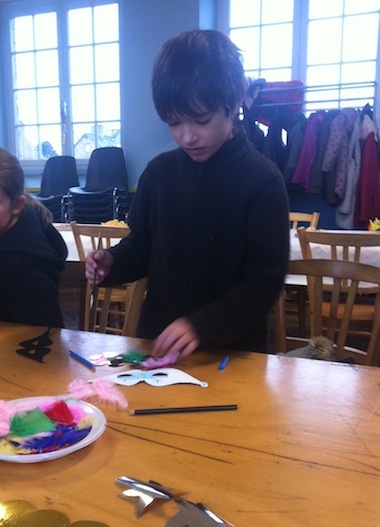 The kids also painted Chinese New Year masks, using a variety of different materials – paint, crayons, feathers, glitter, pipe cleaners, beads, foil, and colorful construction paper. This was a lot of fun! 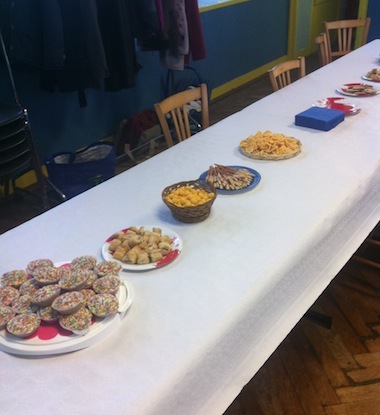 When the crafting was done, the kids all got together at a long table to eat a variety of snacks and other foods that each of the sets of parents had brought to the party. Our family brought the pretzel sticks dipped in chocolate… our son and daughter both helped to make them. Pretzel sticks dipped in chocolate are easy to make – simply melt the chocolate and roll the pretzel stick tips in it; then cover the melted chocolate in sprinkles or other colorful confectionery. When the chocolate dries, the pretzel sticks are easy to pick up and eat, and make for a colorful and creative snack. The Europeans had never seen this sort of thing before! This made us happy – we’re always glad to introduce something North American to our British and French friends! In all, we had a fun day out, and our kids got to learn about the Chinese New Year tradition – and even a little bit about snakes. I hope that you’re having a terrific February so far, and if you are celebrating Chinese New Year, I hope it is wonderful!